This Sunday morning, the news will be dominated by the counting process at Naxxar. During the night, until approximately 10.00am this morning, all ballot boxes will be opened and a reconciliation of the votes actually cast is made. The actual counting is scheduled to commence at 10am. Depending on the difference in votes between the large parties, we may have the first forecast of the result within 30 minutes. However, if the difference is minimal, as was the case in 2008, it will take much longer for accurate forecasts to be made: it may well be in the early afternoon. 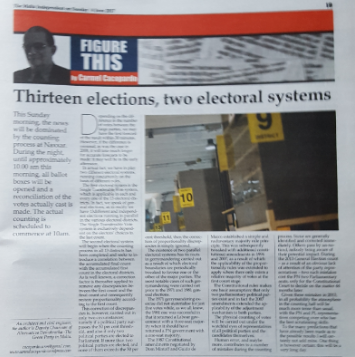 In actual fact, we have in play two different electoral systems, running concurrently on the basis of different rules. The first electoral system is the Single Transferable Vote system, which is applicable in each and every one of the 13 electoral districts. In fact, we speak of general elections, as in reality we have 13 different and independent elections running in parallel in the various electoral districts. The Single Transferable Vote system is exclusively dependent on the electors’ choices in the last count. The second electoral system will begin when the counting process in all 13 districts has been completed and seeks to introduce a correlation between the accumulated final count result with the accumulated first count in the electoral districts. As is well known, a correction factor is thereafter applied to remove any discrepancies between the first count and the final count and consequently restore proportionality according to the first count. This correction of discrepancies is, however, carried out in only two circumstances: namely if a political party surpasses the 50 per cent threshold, and also if only two political parties are elected to Parliament. In more than two political parties are elected, and none of them exceeds the 50 per cent threshold, then the correction of proportionality discrepancies is simply ignored. The existence of two parallel electoral systems has its roots in gerrymandering carried out, as a result of which electoral boundaries are periodically tweaked to favour one or the other of the major parties. The most notable cases of such gerrymandering having been carried out prior to the 1971 and the 1981 general elections. The 1971 gerrymandering exercise did not materialise for just five votes while, as we all know, the 1981 one was successful in that it returned a Labour Government with a three-seat majority when it should have returned a PN government with a one seat majority. The 1987 Constitutional amendments negotiated by Dom Mintoff and Guido de Marco established a simple and rudimentary majority rule principle. This was subsequently tweaked with additional constitutional amendments in 1996 and 2007, as a result of which the applicability of the proportionality rules were extended to apply where there only exists a relative majority of votes at first count stage. The Constitutional rules makes one basic assumption: that only two parliamentary political parties exist and in fact the 2007 amendments extended the applicability of the adjustment mechanism to both parties. The physical counting of votes will be carried out under the watchful eyes of representatives of all political parties and the candidates themselves. Human error, and maybe more, contributes to a number of mistakes during the counting process. Some are generally identified and corrected immediately. Others pass by un-noticed, nobody being aware of their potential impact. 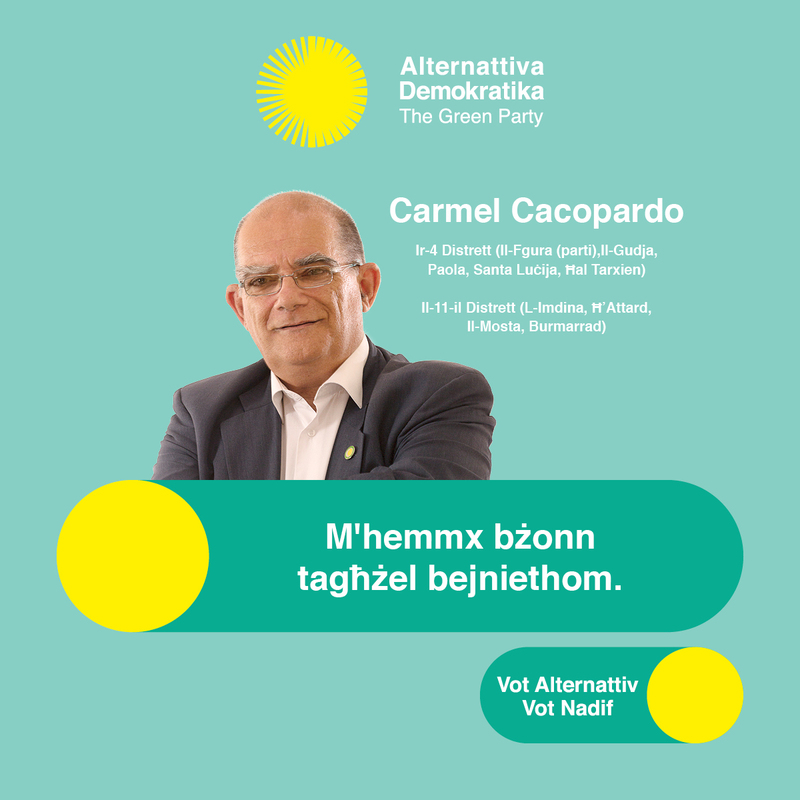 During the 2013 General Elections count – as a result of an obvious lack of attention of the party representatives – two such mistakes cost the PN two Parliamentary seats, only for the Constitutional Court to decide on the matter 44 months later. Given these mistakes in 2013, in all probability the atmosphere in the counting hall will be more tense than usual, with the PN and PL representatives competing over who has the best scrutinising skills. To the many predictions that have already been made as to the possible results I will certainly not add mine. One thing is however certain: this Sunday will be a very long day. The general election is being over-shadowed by a web of corruption spun around the Office of the Prime Minister. It has been unravelling for months since the publication of the Panama Papers. Months of debate has highlighted the need for Parliament to reclaim the authority which, over the years, it has ceded to government. All institutions require continuous Parliamentary oversight: even the civil service needs to be properly monitored by Parliament. The PN are proposing labour-proof institutions. In reality the institutions need to be PN-proof as well – as both major political parties have had exclusive control of institutions over the years, bending them to their will. The current mess is the direct result of a two-party system that spread its tentacles through the institutions creating empires with the specific aim of buttressing those in power and protecting them in their time of need. It is a two-party system which, over a 50-year period, has developed a winner takes all mentality, as a result of which only those aligned to the winner are deemed to be able to contribute to the well-being and development of the country. The rest, with few exceptions, have been repeatedly excluded, and it is Malta which, ultimately has lost the utilisation of substantial talent. 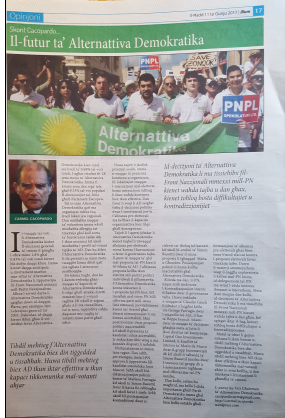 This is the background to Alternattiva Demokratika’s electoral manifesto. Entitled Vote Green – Vote clean, without ignoring other important issues, it focuses on matters of governance in addition to its core environmental proposals. We have plenty of good laws. The problem is that, many times, the pool of talent from which those who implement such laws are selected is generally limited to those carrying the party card. Successive governments have often preferred the politically loyal to the technically and ethically competent. This has been possible due to the fact that Parliament has abdicated its responsibilities and assigned them to the government. Parliament should reclaim the authority ceded to government to appoint authorities and it should proceed to screen those nominated through a public hearing by a Parliamentary Committee on the lines practised by the Senate of the United States of America. This screening by Parliament should be applicable first and foremost to all constitutional authorities, as well as to all authorities set up in terms of law. Likewise, the appointment of Commissioner of Police, the Head of the Armed Forces, the Governor of the Central Bank, the Head of the Civil Service and ambassadors, as well as all civil service grades from Director up to Permanent Secretary, should be subject to Parliamentary scrutiny. In addition to ensuring a more serious selection process, this would serve as a safety valve protecting the civil service itself from abusive action on the part of an incoming government as happened in 2013, when the Head of the Civil Service and practically all Permanent Secretaries were removed in the first minutes of a new Labour government. The recruitment of people of trust on a large scale during the past 4 years has further politicised the civil service. It is a practice that has been on the increase even before March 2013. 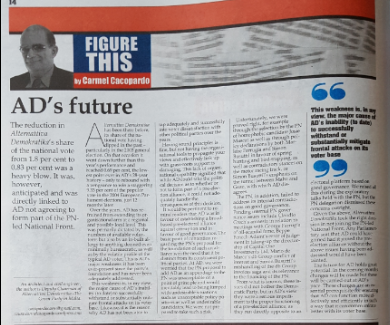 The engagement of people of trust throughout the wider public service was used as a stratagem to avoid the scrutiny of the Public Service Commission, a constitutional body established specifically to ensure a fair recruitment process. This should cease forthwith, with the engagement of people of trust being limited to the private secretariats of holders of political office. The Standards in Public Life Act, which ironically was supported by both the PN and the PL, was approved by Parliament shortly before dissolution. It provisions were therefore not implemented. In particular, the appointment of a Commissioner for Standards in Public Life – to be tasked with investigating the behaviour of MPs – has not yet materialised and will have to be addressed by the new Parliament elected on 3 June. Lobbying is not yet regulated. In fact, its regulation has been postponed as no agreement was reached between the PN and the PL about possible lobbying regulations. AD considers that the next Parliament will have to address head-on whether Members of Parliament should be full-timers, thus severing all links with profession and/or employment and, as a result, substantially reducing instances of conflict of interest faced by Members of Parliament. 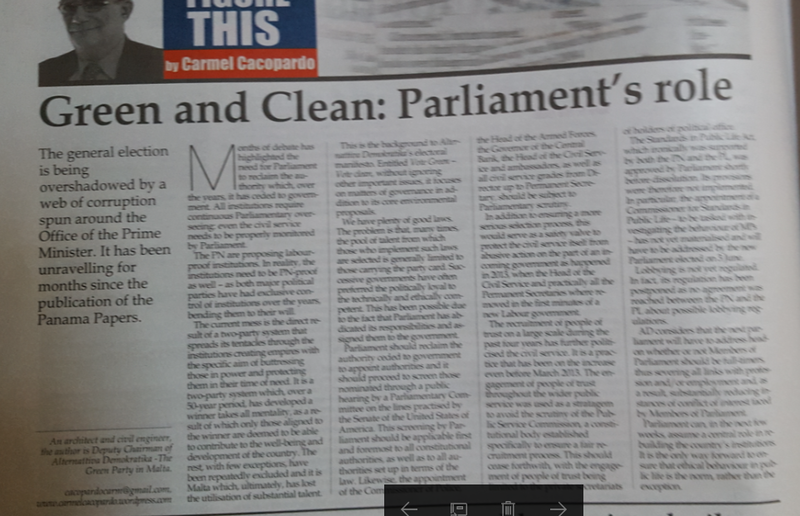 Parliament can, in the next few weeks, assume a central role in re-building the country’s institutions. It is the only way forward to ensure that ethical behaviour in public life is the norm, rather than the exception.